The summer solstice celebration will take place at the scenic & ancient site of Chaco Canyon, (Fajada Butte pictured above) which is well known as a sacred place for the Hopi, Zuni, and Pueblo communities of New Mexico gifted with many solar alignments at the summer solstice. Photo by Rationalobserver – Own work, CC BY-SA 4.0 Image has been modified. This summer solstice the friends of Chaco Canyon will be sponsoring the Kitzit dancers from Laguna Pueblo. The “Kitzit” – Laguna Youth Dance Group consists of 9-12 dancers and singers. They range from 9-22 years of age and have been dancing together since 1998. The group has traveled extensively, sharing their dances, songs and stories of their culture & families. There is more information about the Kitzit Dancers on the Native Pathways website. To see some beautiful images of previous years’ Kitzit Laguna Youth Dance visit The Friend’s of Chaco Canyon website. This event will showcase the customs, culture, and tradition of these peoples through the inspiration of age-old costume and dance. One particular ceremonial feature is the Eagle Dance in which youth from the Kitzit Laguna Youth Dance Group will perform a prayer-ceremony in the form of dance. Interestingly, the Eagle Dance, honors and personifies the bird as it takes a person’s/the dancers’ prayers up to the creator – as depicted by the eagle that circles high into the sky. 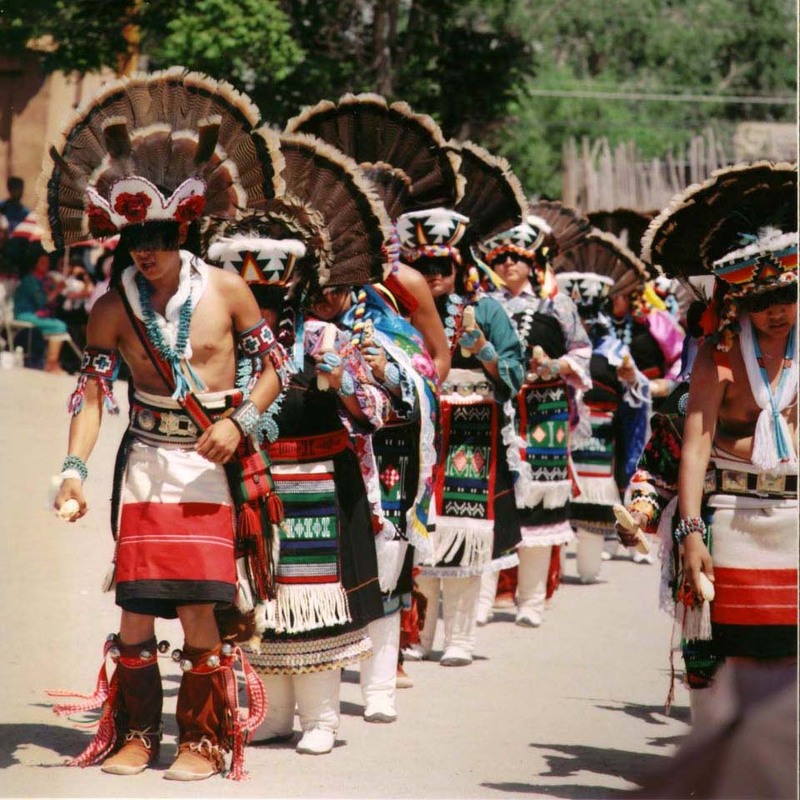 Although we weren’t able to find or use any current media from the Kitzit group, below is a video of a local group called The Dancers of The Pueblo of Laguna performing very gracefully and beautifully “The Eagle Dance” in 2011. Directions: The nearest airports are Farmington, NM, Gallup, NM, Durango,CO, and Albuquerque, NM. Visit this site for further directions to the event. I also really like these dances – they seem to mean a lot to those who perform them. I like that they don’t just honour the animals who represent a deep spiritual connection to them but they also honour the animals which provide for them such as buffalo and the butterfly as it was mentioned on the Native Pathways website. Beautiful! I absolutely love these dances. 🙂 Thanks Christos and Olga for bringing our attention to them. The small eagle in the middle (from the first dance video) is so cute. I really like how they involve children in these dances, I think its such a wonderful way of teaching them about beauty and the spiritual side of the natural world. I can totally imagine my nephew or niece dancing something like that, if there was an opportunity… and of course, myself too! 😀 I listened to the audio on the Native Pathways website, where they explain more about the dances, and really liked what they said about a dancer becoming a spirit of the animal during the dance, trying to capture its essence. I think this could be a great meditation/concentration technique – to feel what it is like to be a certain animal, but also a plant, water, fire, or a planet, etc… through the dance. Yes I found this little fellow very good too. It’s as though he naturally captured the essence of the dance despite the freshness of his years. Educating the youth is a big part of the Hopi and Pueblo cultures. Their growth or extinction depends on them in some ways. It is actually quite amazing that the dance group that will be performing at the Friends of Chaco solstice event was initiated by the Pueblo youth, a 13 year old who wanted to rediscover and revive his culture – using dance as a fun way to get the youth in his community involved in its teaching. I very much like these dances as well, I never really thought about dance as a form of prayer, so it was interesting to learn about them and consider how vast and colourful are the ways people express their connection with spirituality.